Milly caught the bride's bouquet but everybody present knew that nothing would come of it...that she wouldn't be the next to marry by a long ways...and they knew the reason why, too. People with halitosis (unpleasant breath) simply don't get by. It is the unforgivable social fault. You never know when you have it—that's the insidious thing about it. Moreover, you are quite likely to have it, say dental authorities. Conditions present even in normal mouths constantly produce objections odors. The one way to make sure that your breath does not offend others is to rinse the mouth with Listerine. From How "Clean" Was Sold to America with Fake Science in Gizmodo. Worth a read if for nothing else than to see some of the photos of unbelievable ads about body odor. Even the use of the term “halitosis” to give bad breath a scientific term, as if it were some serious malady, is fiendishly clever. 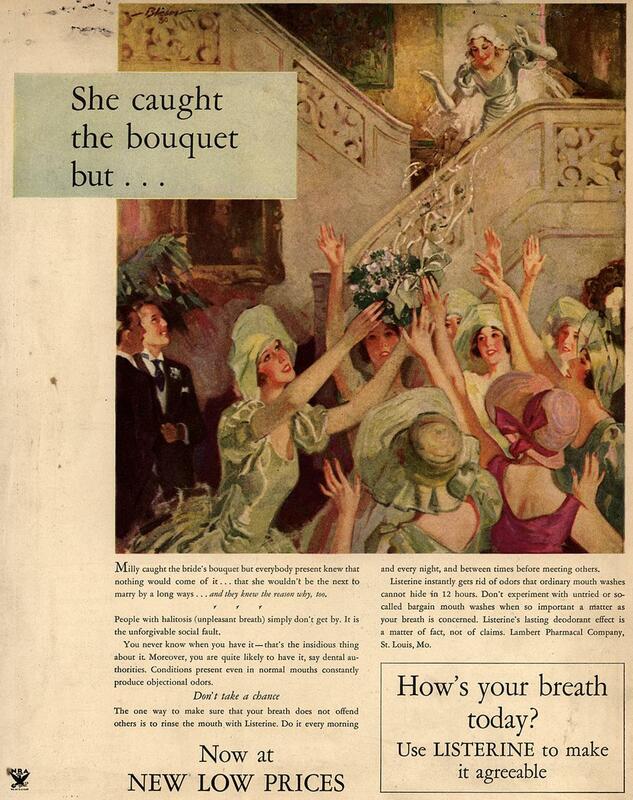 It's also shocking how the ads pictured are all targeted at women, reflecting the sexism of their times. The tech industry has a lot to learn from consumer packaged goods companies about how to manufacture demand or consumer desire. The ads in this piece are negative and scare mongering, but companies like Procter & Gamble are just as good at generating desire with positive emotional triggers. It still feels like most tech brand advertising derives from viral stunts. One notable exception, of course, is Apple, most of whose ads now have more in common with fashion ads than technology ones. See how this story ends. Cards Against Humanity: Giffen good? The sale made people laugh, it was widely shared on Twitter and Tumblr, and it was the top post on Reddit. The press picked it up, and it was reported in The Guardian, USA Today, Polygon, BuzzFeed, All Things D, Chicagoist, and AdWeek. It was even the top comment onThe Wirecutter’s front page AMA, which had nothing to do with us. I was pretty sure that our fans would be into the “$5 more” sale, but I had no idea that it would turn a day where we’d normally be totally overlooked into a huge press hit for the game. So how did we do? A little better than last year. We kept our position as the best-selling toy or game on Amazon. My guess is that peoples’ buying decisions just weren’t that affected by $5. The interesting thing to note is that we got a nice lift in our sales the day after Black Friday (“Regret Saturday”). That might be from people who were waiting to buy the game until it came back down in price, or, more likely, those are sales from people who heard about the game after our Black Friday press. Not bad for an ad that paid us to run it. When they say any PR is good PR, what they mean is that sometimes it's good to just break through the noise, regardless of why, especially if you're a smaller player. In those cases, the economic benefits from increased awareness outweigh any downward sales pressure from the negative PR since not enough people know about you anyhow. In this case, it worked even better because Cards Against Humanity is already a subversive brand. It's not for nothing their tagline is “a party game for horrible people.” While I don't think this would hold in the long run, it was a fun one-day stunt on a day that was otherwise a torrent of deal spam and indignant tweets complaining about the commercialization of all that is sacred.